Rewards for your everyday debit card purchases. 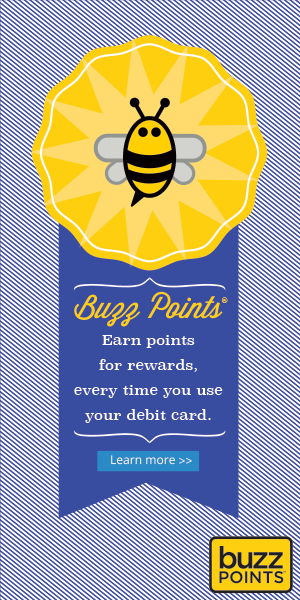 Buzz Points is your debit card rewards program designed to reward you for your loyal activity. This FREE feature of your account integrates directly with your debit card. All you have to do is enroll now! Earn Points Everywhere You Shop! You will receive an email with instructions on how to set up your username and password to complete your enrollment. Once you complete your enrollment the points will start adding up. Download the Buzz Points app to easily find Buzz Points Local Preferred Merchants where ever you are, nationwide. Not yet sold on Buzz Points? Check out our DECU blog for a real member experience. The beauty of Buzz Points is that you can sign up then forget about it and let the points pile up! However, don't forget about them for too long. Points can expire if they are not redeemed within 24 months. It's important to make sure your current debit card is linked to your account. If your card is lost or stolen and a new card is issued, be sure to update the card number. Points are worth more when redeemed at local establishments. We love our community and want to support those local businesses! Enroll now and start earning points. It's a rewarding experience!